Find out what Desktop Virtualization is all about and how it can save your business time and money by simplifying client computer management. Read on to find out more. There is growing interest in Desktop Virtualization with its promise of improved manageability, security and efficiency for the business. Simply put, Desktop Virtualization is new technology that separates the system software such as the operating system and applications from the underlying hardware. Desktop virtualization allows the hardware, like a laptop or a server, to run multiple operating systems. Imagine having your Mac running Microsoft Windows and Office, or your Dell running OS X and GarageBand for example. To stretch the concept even further, operating systems and applications can be housed on remote machines – such as a server farm in Texas – which you access via the web. The applications are not resident on your computer at all. Desktop virtualization shifts the burden of managing the system software from you or your in-house IT teams to someone else—people who can do a better job managing and updating your Windows and Office software than you can. If you have a fairly large organization managing a large number of machines, centralizing support allows the organization to gain from economies of scale—ie less people to manage more machines at less cost. Leveraging the computing power of server farms with faster machines also allows employees to get more value out of aging desktops and laptops. Enabling anytime, anywhere access to applications and data, Desktop Virtualization connects your employees to the tools they need no matter where they are. As organizations support more and more remote employees, using desktop virtualization technology gives them access to their Windows desktop anywhere in the world, at any time, on any device. Are you supporting remote workers or is your hardware slowing down your employees? 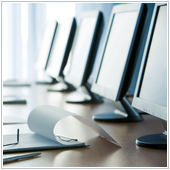 Let’s talk about Desktop Virtualization and how you can try it for your organization today.